Canada Place is situated on the Burrard Inlet waterfront of Vancouver, British Columbia. It is the home of the Vancouver Convention Centre, the Pan Pacific Hotel, Vancouver's World Trade Centre, It is also the main cruise ship terminal for the region, where most of Vancouver's famous cruises to Alaska originate. Construction on it began in 1983, finished in late 1985, and was open for Expo 86 as the pavilion for Canada and was the only venue for the fair that was not at the main site on the north shore of False Creek. The building was designed by architect Eberhard Zeidler. More cruise ships than ever before are sailing the West Coast waters. A Vancouver to Alaska cruise is one of the most desirable cruises on any cruise lovers list. These cruises usually cost more than most other cruises such as the Caribbean, etc. The cruise season runs from April through to September. Demand is very high for Vancouver to Alaska glacier tours. 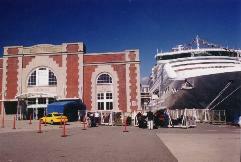 Port of Vancouver second cruise facility, is located near the city centre and just minutes away from Canada Place. The entire terminal underwent a major expansion and renovation in 1995, ensuring modern and efficient services to the cruise industry.